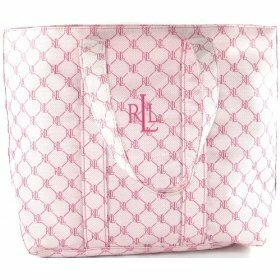 If you're a girly girl who loves Ralph Lauren, I may have just found your ideal bag. But if you're not, this open top tote probably won't impress you. While this pink purse is clearly targeted at Barbie-loving stylistas, it's not as obnoxious as many bags of its ilk. The pink background is pale and subtle, ensuring the pink-on-pink monogram print doesn't look too garish. It could have so easily, but Ralph Lauren somehow manages to create a tote that's obviously feminine, yet entirely appropriate for the office. The interior's workplace appeal is a little limited though. I'd prefer more compartments in an office bag, but three interior pockets isn't bad for a tote. The slip pouches could handle your Blackberry and iPod, while the larger zippered pocket could hold your pens. My biggest problem is the lack of security. Without a zip or even a magnetic snap, I'd worry about my goodies spilling out once I set it down. This tote has its charms, but unless you're a pink loving Ralph Lauren disciple you'll probably be immune. The shape, signature print, and styling aren't anything we haven't seen before. At $55 it's an affordable designer bag, but not one that's particularly inspiring. The Ralph Lauren brown open top bag, a great alternative to this pink bag.